Adams Luxliner Transport Is the bus company in South Africa which established to provide travell services to the community. This company was started in 1976 by James Alfred Adams and his wife Cornelia with their five sons as a family business offering transportation services to their local community in Ravensmead and surrounding areas, after identifying a gap in the market as a public transport service provider. James managed the business until 1989 when his son Donovan took over and named it Adams Taxis. 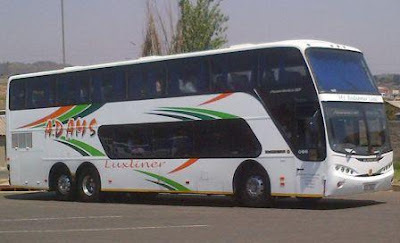 Over time the focus of the business shifted from taxis to mainline bus services and was named Adams Luxliner from which it grew till where it stands today. Comprehensive insurance is held on all our vehicles and is managed by Venshaw Insurance Brokers. They have established a long term relationship with our brokers and have been under their care for approximately 10 years. Passenger safety remains their first priority at Adams Luxliner, apart from regularly servicing of the vehicles to maintain the safe and reliable condition of each, They have insured separately a passenger liability for any loss or claim against the company should any passenger be affected by an accident or suffer loss as a result of using our services. Passenger liability is insured with Venshaw Insurance Brokers and is fully comprehensive. 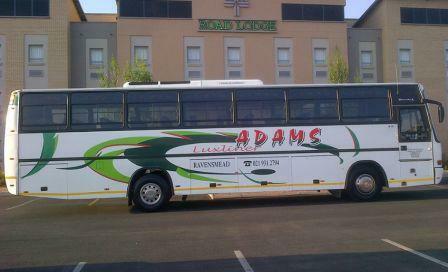 Daily transport services for learners to and from schools as well as West Coast FET College. They also supply transport services for excursions and recreational outings. They supply charter services for various Businesses, Schools, Church groups etc in and around the Western Cape. Services include End of year functions, Daily trips, Tour around the peninsula, day outings to recreational parks and day camping sites. They specialize in servicing annual republic tours organised by various tour group operators and transport them around the Republic of South Africa. Areas include, JHB, Durban, Port Elizabeth, Bloemfontein, Sun City, Lesotho and Swaziland etc. Transport services for long distance trips are supplied to various clients for trips around the Republic of South Africa. 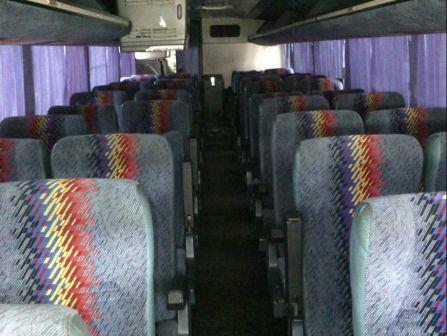 Trips include, Business Conferences, Sports Tours, Church Conferences, Family trips etc. They assist their local community in the Northern Suburbs with transport services in their time of need. Services include transports from home to church, cemetery or Crematorium and back home. Their Services include hiring of vehicles for film shoots, Advertisements, photo shoots, staff outsourcing transport.